Ever since Michael Jordan retired — all three times, really — the NBA has searched for the heir to his throne. Many players have popped up as pretenders to the throne, from Harold Miner to Jerry Stackhouse to Vince Carter. In recent years, people have stopped trying to find a clone and just searched for a similarly dominant great player. If you ever wondered why LeBron James is seen as such a failure, a lot of it has to do with his inability to meet the example set by Jordan. 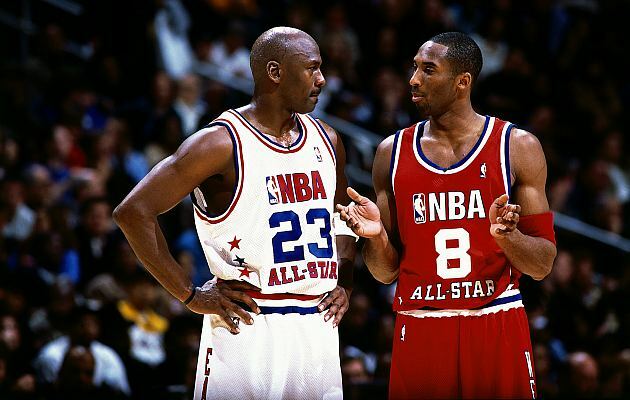 Kobe's ultimate competition is MJ. That's why MJ watches him. MJ made people think what he was doing wasn't human. Ditto the Kobester. I never said Kobe was better than MJ. MJ just told me Kobe's the only one to have done the work, to deserve comparison. Congratulations, Kobe: Your life's work has meant something. All that time spent aping Jordan's movements and skills has paid off. He acknowledged you. You made it. Of course, if the notoriously petty Jordan was going to mention anyone, it makes that he'd single out Kobe, and not just because he'd consider the mimicry flattering. Bryant really does work harder than everyone else, and he's been good for long enough (with no signs of slowing down) that he may eventually top Jordan's longevity. They're similarly insane competitors. The "Next Jordan" idea was always a silly one, but Bryant is certainly the player most like Jordan in all aspects of his game — even if he eventually becomes something less than the greatest player of the post-MJ era, which I'm sure many of you will argue in the comments. That's an accomplishment in itself. Even coming close to the top means something.